From the tender years of his youth, Ridha Behi would slink from school to the nearby movie theater and discover masterworks of the silver screen. It was then that he was smitten with the magnetism of Marlon Brando. Years later Behi, now an award-winning filmmaker, met Anis Raache, a young Tunisian actor who bears an uncanny resemblance to Brando. Inspired, he wrote a script casting the two. He attempted to contact the Hollywood legend for years and, through hopelessly circuitous channels, dispatched the screenplay to him. 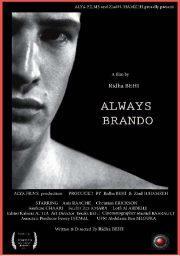 In 2004, Béhi received a phone call from Brando and was summoned to his hilltop mansion in Los Angeles to discuss the project. In the spring of that year, Behi spent days reworking the script with the dispirited star, but by summer, Brando’s health gave out and he died.